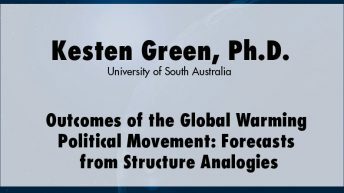 Dr. Kesten C. Green is a senior research fellow of the Ehrenberg-Bass Institute and teaches managerial economics in the University of South Australia Business School. 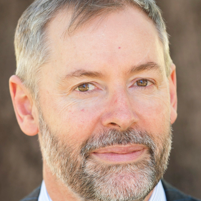 He is co-director of forecastingprinciples.com, a site promoting evidenced-based forecasting, and is a pioneer of methods to predict the decisions people will make in conflict situations such as occur in wars and in business. He has published papers on the effects of labelling regulations and of corporate social responsibility policies. 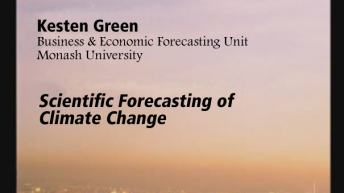 Dr Green became interested in climate forecasting out of concern that the alarming predictions of the Intergovernmental Panel on Climate Change and others were being used as the basis for harmful government policies. 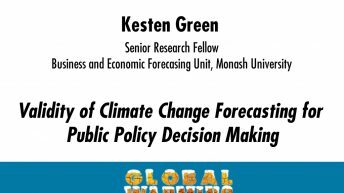 He has found that IPCC forecasting methods violate forecasting principles and that forecasts of no change in temperatures are much more accurate than the IPCC's dangerous manmade warming forecasts.